Hourlong superhero adventure. Twenty-one season-one episodes watched for review. The rest of The Flash’s first season has lived up to that tweet. The series has been delivering all the delights of Silver Age DC comics—superpowers, weird science, colorful villains, and, yes, a psychic gorilla—without ranging too far into campiness or winking. And it’s become a bona fide hit, delivering record numbers for its network and selling well to foreign markets. The Flash’s success has been reassuring to the contingent of comic book fans who wish live-action superheroes were more… okay, let’s just say it: fun. The former’s a known issue. The emo atmospherics in the images and clips from the upcoming Batman V. Superman: Dawn Of Justice have been roundly mocked online, as have the rumors of a general “no jokes” policy for DC movies. Fox’s Gotham and The CW’s Arrow have moments of levity and wackiness, but both are predominately grim and violent. Marvel has been better about adding humor to the mix in its movies and TV series, but it still has its gloomy Daredevil on Netflix, and the Fox movie versions of Marvel’s X-Men haven’t exactly been a barrel of laughs (aside from the zippy First Class, still the best of the X-Men films). The theme problem is trickier, and hard to define without sounding like a spoilsport (or a cretin), but here goes: While movies like Avengers: Age Of Ultron and The Dark Knight Rises are very good, they seem to be trying too hard to inspire lengthy essays and editorials, overtly asking to be taken seriously. Cultural relevance is absolutely something that a superhero movie should aspire to, but there’s also a virtue in simply telling a story, and letting the themes emerge more naturally and subtly. The Flash has bucked both of the prevailing trends in live-action superheroes. The first episode introduced Barry Allen (played by Grant Gustin), a science geek and Central City CSI who acquires super-speed after an accident involving a S.T.A.R. Labs particle accelerator designed by Dr. Harrison Wells (Tom Cavanagh). From there, the show has raced merrily ahead, nearly every week introducing a new super-powered villain—or “rogue,” in Silver Age Flash lingo—affected by the S.T.A.R. explosion. This season has also unraveled the mystery of Dr. Wells, who’s helped Barry control his powers and beat bad guys with the assistance of his employees Cisco Ramon (Carlos Valdes) and Dr. Caitlin Snow (Danielle Panabaker), but has also been revealed as a manipulative, malicious mastermind from the far future. The speediness of The Flash (so to speak) has had a lot to do with how well it’s done. For the most part, the plotlines haven’t been overly drawn-out or wheel-spinning. This show isn’t big on arcs, per se; instead, it’s delivered a string of standalone episodes with a villain of the week, while relegating the ongoing story of Wells and all of the characters’ personal relationship dramas to subplot status, to be moved to the center as needed. That alone has made The Flash feel livelier and more action-packed than a lot of other serialized adventure series. Two other major factors make The Flash fun: the special effects, and the cast. Because The Flash isn’t working with a mega-budget, it can’t be wall-to-wall superheroics. But the producers get a lot out of a little, using digital animation and enhancements to bring a larger-than-life, splash-page feel to the few minutes of zooming and fighting they can afford each episode. (Little touches help sell the reality too, like the way Gustin’s Barry always skids a little bit whenever he comes back from a run.) The actors, meanwhile, run the gamut from entertainingly shameless scenery-chewers like Wentworth Miller as Leonard “Captain Cold” Snart and Mark Hamill as James “The Trickster” Jesse to the more quietly ingratiating Jesse L. Martin as police detective Joe West (Barry’s guardian since childhood) and Rick Cosnett as Joe’s partner Eddie Thawne. A lot of The Flash’s players have musical theater training, and week to week they’ve drawn on that experience to fit neatly into the ensemble while waiting for their solos. Gustin has set the tone for the Flash performances, pitching his take on Barry halfway between Valdes’ Cisco (with his boyish enthusiasm, clever problem-solving, and undisguised pleasure at being able to name all of The Flash’s rogues) and Cavanagh’s Wells (with his muted gravitas and halting speech patterns). The show itself has followed suit, reveling in all that’s nutty and geeky about old Flash comics while trying to stay relatively grounded. 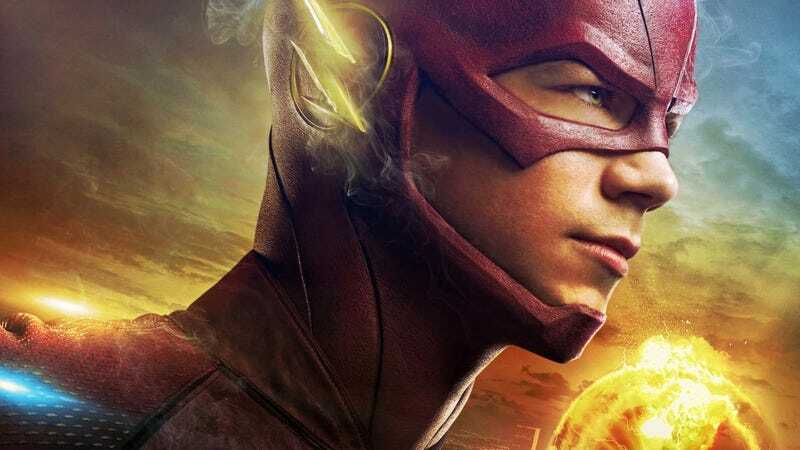 The Flash isn’t the 1960s Batman, and while it has some elements in common with Joss Whedon’s Buffyverse and Avengers movies—namely the team-as-family concept, and the willingness to go big with the storytelling—the overall approach is a little less knowing than Whedon. The Flash’s characters recognize how unusual their lives are, but they’re more excited about it than ironic or tortured. It’s very easy to oversell The Flash—and perhaps the preceding few paragraphs does just that—so let’s be clear here. The Flash isn’t The Americans, or Mad Men, or Game Of Thrones, and though it’s every bit as delightful as its network-mate Jane The Virgin, it’s not as inventive or as skillful. The show isn’t especially complex emotionally or narratively, and while it hasn’t produced an awful episode, even its best weeks have glaring weak spots. The Flash’s biggest obstacle has been Barry’s ongoing non-romance with Joe West’s daughter Iris, his childhood best friend and the character that Barry Allen marries in the comics. Like Gotham—which has never been able to figure out what to do with Barbara Kean, the mythology-mandated love interest for its hero—The Flash has botched Iris, and may never be able to fix the problem so long as it stays on-book. Gotham ditched Barbara early on, giving policemen Jim Gordon a much more compelling match in Morena Baccarin’s Dr. Leslie Thompkins; but if the show’s creators mean to hew close to the Batman story, Jim will eventually have to end up married to Barbara. The Flash meanwhile has doggedly kept Candice Patton’s Iris West around, but has given her none of the pluckiness or maturity of the comic book version. The character as written right now is a drag, and next season The Flash’s creative team might have to reboot the character—continuity be damned—or else make some radical changes to Flash history. These are the kind of problems that can creep into a TV show that isn’t aspiring to be high art. The plotting can be a little sloppy, and the overall premise a little too niche to recommend to a general audience. The Flash is primarily for people who want to watch a show about The Flash—whether it’s longtime fans who’ll dig the references to Ferris Air and other DC universe lore, or newcomers who can get on board with the idea of a futuristic speedster costume that’s compressed into the ring on said speedster’s finger. Throughout this first season, some Flash fans raised legitimate questions about one of the dicier elements of the series, which has seen Barry and his team locking up their villains in a containment facility, rather than turning them over to the civilian criminal-justice system. Season one’s penultimate episode tackled the ramifications of that head-on, and did so fairly well. But The Flash would be a different and very likely a lesser show if it stopped the action every week for a series of ethical debates (as Arrow so often does). The key to The Flash is its rip-roaring, gung-ho spirit. This is a show that knows it’s better to have a psychic gorilla than to spend a lot of time talking about a psychic gorilla.